My house has been full these last few weeks, filled with family and good times. Of course, it has kept me busy but it is a joy to have more folks to feed. 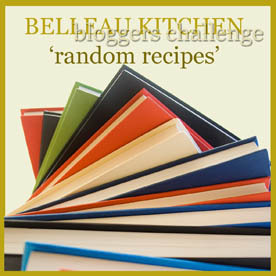 Since I am always looking for new ideas, I am delighted to take part for the first time in Belleau Kitchen's Random Recipe Challenge. Here’s how the Random Recipe Challenge works: Number your cookbooks and choose one randomly. Or make a big pile of them and pick one out with your eyes closed. Then make the first recipe on the first random page you open. Since I belong to EatYourBooks, this was very easy. Right now I have 89 cookbooks registered (Don’t ask me how many aren’t yet!) so I asked my daughter to pick a number and she said 11. I counted down and the 11th book on my list is Nigella’s Kitchen. One of my very favorite cookbooks! The random page I opened to was her Pecan Maple Bundt Cake, which I had yet to make, so it was perfect. I don’t have maple syrup in Cairo but thankfully the Random Recipe rules allow for substitutions for availability or dietary restriction. So here goes. Preheat the oven to 350°F or 180°C and grease your Bundt pan. First, make the filling. Toast your pecans in a baking pan for about 10-15 minutes in the preheating oven. Watch them carefully so they don’t scorched. Chop the pecans roughly. Mix the flour with the butter using a fork. You want it to look like small crumbs. Stir in the cinnamon, chopped pecans and golden syrup. This will be very thick, almost solid. Set aside. To make the cake batter, measure your dry cake ingredients into a small bowl: the flour, baking powder, baking soda and salt. Mix well. Cream the butter and sugar together in a large bowl with beaters or in your standing mixer. Then beat in one tablespoon of the flour mixture, then one egg. Then add another tablespoonful of flour mixture followed by the second egg. Add the rest of the flour mixture and beat while adding the sour cream. The batter will be very thick. Spoon just more than half of the cake batter around the Bundt pan. Spread the batter up the sides so that you make a channel of sorts in the middle of the batter. This is to avoid having the filling leak out while baking. Use a tablespoon to fill the channel in the batter with your pecan filling. Cover with the remaining batter and smooth the top. Bake in the preheated oven for 30-40 minutes. Check with a cake tester after 30 minutes. Make sure to get the tester into the cake part because the filling will probably not come out clean, even when the cake is baked through. Let the cake cool for 10-15 minutes and then loosen the sides with a small spatula or knife. Turn the cake out. Cool completely and then decorate by sprinkling with icing or confectioners’ sugar. This cake was gone in a heartbeat! I think they even licked the plate. If you would like to join the next challenge, follow Belleau Kitchen on Twitter or join the group on Facebook. Click on the graphic to see how other bloggers have met the challenge this month! This looks so decadent! And I love the idea of cutting into a bundt cake to find a surprise! oh wow I really love your bundt tin, it is so pretty and vintage... really sweet... and yes, this is an adorable recipe too taken from a brilliant book, which I love too... thank you so much for finding the time to squeeze me in, I do love my random recipes virgins, so thanks for coming on board and I look forward to many more random cooks! You should see my REALLY vintage one I bought last year at an antique shop in Geneva! This one is just old. :) But I love it. Thank you for hosting this challenge! Can't wait to see what everyone else comes up with! Especially your post from The Apple Source Book. It was a lot of fun, Katherine. You should join us for September's random recipe challenge. The theme is teatime treats! Thanks, Jenny! It was pretty tasty! And pretty too.